1. HOW TO ENTER: This contest begins 12:01 A.M. EST on September 24, 2010 and ends 11:59 P.M. EST on October 21, 2010. To enter online, go to www.health.com/fairmont-scottsdale-princess and follow instructions to submit your original essay stating in 50 words or less on why you deserve a relaxing spa vacation. Limit one entry per person or email account. Entries become sole property of Sponsor and none will be acknowledged or returned. Essays should be submitted in English. Essays exceeding 50 words or handwritten may not be considered. Sponsor is not responsible for lost, late, illegible, or incomplete entries; or entries not received for any reason. By entering, Entrant warrants that his or her entry (1) is original and does not infringe the intellectual property rights of any third party, (2) has not been published in any medium or (3) has not won an award. 2. JUDGING: All entries will be judged by an editor of Health magazine, based on the following criteria: Originality (25%); Creativity (25%); Use of language (25%); and Appropriateness to contest theme (25%). In the event of a tie, an additional "tie-breaker" judge will determine the three Winners from among all such tied entries using the judging criteria above. Incomplete and/or inaccurate entries and entries not complying with all rules are subject to disqualification. Decisions of judges are final and binding. The Winner will be notified by email or telephone on or about, November 8, 2010. 3. ELIGIBILITY: Open to legal residents of the 50 United States and the District of Columbia who are 21 years or older at time of entry. Void where prohibited by law. Employees of Health Publishing Inc. and HSN and Full Picture PR and their respective parents, affiliates and subsidiaries, participating advertising and promotion agencies (and members of their immediate family and/or those living in the same of household of each such employee) are not eligible to participate or win. All other expenses not specified herein are the responsibility of the Winner. ALL TAXES ARE THE SOLE RESPONSIBILITY OF THE WINNER. The prize is awarded without warranty, express or implied, of any kind. Luxurious four-night stay for two in a Fairmont Scottsdale Princess room; 30-minute fitness session for two with a Willow Stream Spa Personal Trainer, focusing on stretching, increasing flexibility and core strength; 30-minute golf instruction session for two with a TPC Scottsdale golf teaching professional; Round of golf for two on either the TPC Scottsdale Stadium Course or Champions Course; "Golf Fit" lunch for two at The Grill at TPC, featuring guest's choice of three specially-prepared meals, including Tuna Albacore Sandwich, TPC Grilled Chicken and New York Strip Steak; Two 60-minute Willow Stream Golf Performance Massages for two, developed in conjunction with world-class golf instructor David Ledbetter and golf professional Charles Howell III, combining massage, stretching and acupressure to improve golf performance and avoid injury; Two additional 60-minute spa treatments for two (including tax and gratuity); and Breakfast for two daily ($25 daily gift certificate, per person including tax and gratuity). 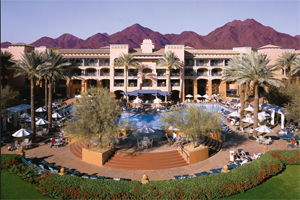 All services and meals must be accepted within the four night's stay at the Fairmont Scottsdale Princess. Transportation provided using American Airlines Advantage Miles. Prize winners will receive 75,000 AAdvantage miles. Winners must provide their AAdvantage Membership number in order for Fairmont Hotels and Resorts to submit your miles award. Note: It may take 1-2 weeks for the miles to be added to your AAdvantage membership program. The prize package will be valid, based upon space availability, November 1, 2010 - November 1, 2011. Room taxes, spa and meals (mentioned) taxes and gratuities will be included. All other gratuities, meals, incidentals (such as parking and Internet) and ground transportation will be the responsibility of the winner. 5. CONDITIONS OF PARTICIPATION: No transfer, assignment, or substitution of a prize permitted, except Sponsor reserves the right to substitute prize (or prize component) for an item of equal or greater value at Sponsor's sole discretion. Nothing in these official contest rules shall obligate Sponsor to publish or otherwise use any entry submitted in connection with this Contest. All federal, state and local laws and regulations apply. Entrants agree to be bound by the terms of these Official Rules and by the decisions of Sponsor, which are final and binding on all matters pertaining to this Contest. By entering, Entrant represents that any essay and other materials submitted as part of Entrant's Contest entry are original and will not constitute defamation or an invasion of privacy or otherwise infringe upon the rights of any third party, and that the Entrant owns or has the rights to convey any and all right and title in such essay and other materials. In addition, by entering, Entrant grants to Sponsor a non-exclusive, worldwide, royalty-free license to edit, publish, promote, republish at any time in the future and otherwise use Entrant's submitted essay, along with Entrant's name, likeness, biographical information, and any other information provided by Entrant, in any and all media for possible editorial, promotional or advertising purposes, without further permission, notice or compensation (except where prohibited by law). Potential Winners, as a condition of receiving any prize, also may be required to sign and return an Affidavit of Eligibility, a Liability Release and where legally permissible a Publicity Release and confirmation of a license as set forth above within 7 days following the date of first attempted notification, certifying, among other things, the following: (a) entry does not defame or invade the privacy of any party; (b) entry does not infringe upon the rights of any third party; and (c) the essay, and other materials submitted are original and have never been published and entry has never won an award. Failure to comply with this deadline may result in forfeiture of the prize and selection of an alternate winner. Return of any prize/prize notification as undeliverable may result in disqualification and selection of an alternate winner. Acceptance of the prize constitutes permission for Sponsor and its agencies to use Winner's name and/or likeness, biographical information, essay or other materials submitted for advertising and promotional purposes without additional compensation, unless prohibited by law. By entering and/or accepting prize, Entrants and Winners agree to hold Sponsor and its promotional partners, its directors, officers, employees and assigns harmless for liability, damages or claims for injury or loss to any person or property relating to, in whole or in part, directly or indirectly, participation in this Contest, the acceptance and/or subsequent use or misuse, or condition of any of the prizes awarded, or claims based on publicity rights, defamation, or invasion or privacy. False or deceptive entries or acts will render the Entrant ineligible. Sponsor, in its sole discretion, reserves the immediate and unrestricted right to disqualify any entrant or prize winner, if either commits or has committed any act, or has been involved or becomes involved in any situation or occurrence which the Sponsor deems likely to subject the Sponsor, entrant or winner to ridicule, scandal or contempt or which reflects unfavorably upon the Sponsor in any way. If such information is discovered by Sponsor after a winner has received notice of his prize and before the prize is awarded, Sponsor may rescind the prize in its entirety. If a portion of his/her prize has already been awarded, Sponsor may withdraw the remainder of the prize that has been fulfilled. Decisions of the Sponsor are final and binding in all matters related to this paragraph. Sponsor is not responsible for any typographical or other error in the printing of the offer, administration of the contest, or in the announcement of the prize. 6. INTERNET: Sponsor is not responsible for lost or late entries nor for electronic transmission errors resulting in omission, interruption, deletion, defect, delay in operations or transmission, theft or destruction or unauthorized access to or alterations of entry materials, or for technical, network, telephone equipment, electronic, computer, hardware or software malfunctions or limitations of any kind, or inaccurate transmissions of or failure to receive entry information by Sponsor or presenter on account of technical problems or traffic congestion on the Internet or at any Web site or any combination thereof. If for any reason the Internet portion of the program is not capable of running as planned, including infection by computer virus, bugs, tampering, unauthorized intervention, fraud, technical failures, or any other causes that corrupt or affect the administration, security, fairness, integrity, or proper conduct of this Contest, the Sponsor reserves the right at its sole discretion, to disqualify any individual who tampers with the entry process, and to cancel, terminate, modify or suspend the Contest. Sponsor reserves the right to select winners from eligible entries received as of the termination date. CAUTION: Any attempt by a contestant to deliberately damage any Web site or undermine the legitimate operation of the game is a violation of criminal and civil laws and should such an attempt be made, Sponsor reserves the right to seek damages from any such contestant to the fullest extent of the law. If there is a dispute as to the identity of the Entrant, the prize will be awarded to the authorized account holder of the email address. The "authorized account holder" is defined as the natural person to whom the email address is assigned. 9. WINNER'S LIST: For name of Winners, log onto www.health.com/fairmont-scottsdale-princess after November 22, 2010 available for a period of 30 days. 10. SPONSOR: The Sponsor of this Contest is Health Publishing, Inc., 1271 Avenue of the Americas, 5th floor, New York, N.Y. 10020.